Upon arrival at the airport, you will be met and transferred (4 hour drive) to Arenal Volcano located in the Northern lands of Costa Rica driving through the Guanacaste province via Liberia, Cañas and Tilaran. 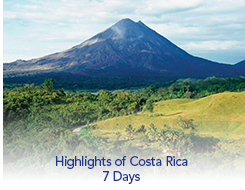 Continue along the scenic Arenal Lake and arrive at your hotel. Weather permitting you may have a beautiful view of the Arenal Volcano.